On December 7, 2000, it was bitterly cold on the East Coast. But it was seasonably cheerful and warm in New York's magnificent Grand Central Terminal, shining and decked out with tasteful holiday decorations. Up the line in New Haven, I was blown off the frigid platform to photograph an arriving Grand Central Metro North local from the rear door window of my Amtrak business class car. All in all a cheerful day for a photographer. 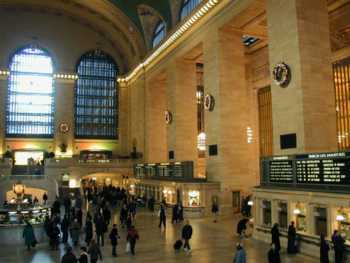 Now, would it be wonderful if Amtrak could put an Acelea Express or two into the world's most beautiful station? Just a wish for the New Year...Happy Holidays! It's March 1963, and the Denver and Rio Grande Western Railroad still ran three trains a day though the Moffat Tunnel to points West. 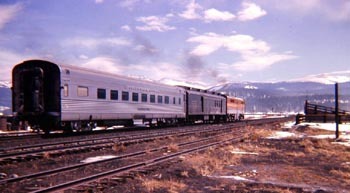 Its main flagships were the California Zephyr and the overnight Prospector, which provided service to Salt Lake City. The one depicted here is Train #10, the Yampa Valley, which hauled mail and passengers to and from Craig, via Orastod and Steamboat Springs. It's long gone and the town where it was photographed, Fraser, is no longer a sleepy high altitude ranching community, but a thriving vacation metropolis. It's 1982 at North Station, Boston. 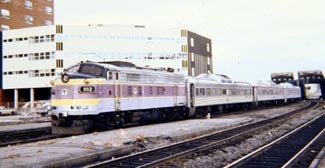 The terminal had turned pretty much into a pile and the old RDC's staffed by employees of the plummeting Boston and Maine and hauled by MBTA engines were on last legs that not even this photographer could show as less than grim. 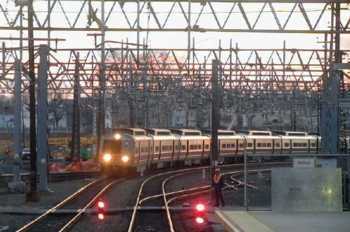 Soon a new MBTA fleet would be in place and, eventually, Amtrak would come to manage the system. 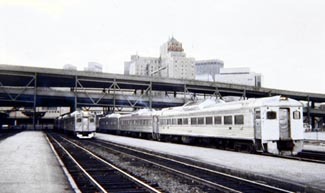 The station, the Boston Garden and the old Madison Hotel were demolished and replaced by the cold architecture of the new Fleet Center and an equally unappealing corridor for passengers. But, new North Shore service to Newburyport is a land office business. Amtrak is due to arrive later this year and with it lies the hope of giving North Station a bit of intercity bustle and, perhaps, a new future that reaches into many underserved parts of Northern New England. None of these pea-aqua paint jobs like Amtrak's slapping on the East Coast about now. Back in the old days Western railroads wanted their trains to be seen for miles, and the paint scheme to represent the boldness of the territory and the confidence of the folks who worked there. A bleak New England winter has sent me deep into the archives for these. 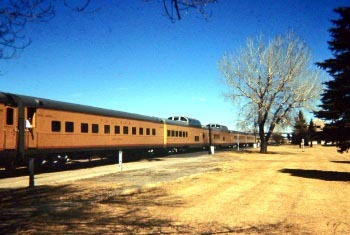 The Union Pacific's City of Los Angeles-City of San Francisco-Challenger Domeliner was parked in Laramie, Wyoming, in the late autumn of 1964 when I first laid eyes and lens on it. And what a sight! 20+ sparkling cars, Pullman porters in crisp whites. Far less pretentious, but gleaming nonetheless, the Northwestern Pacific's No. 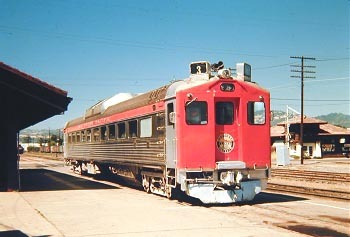 4, was parked in Santa Rosa, just north of San Francisco, when I caught it a few years later. It would head up into the redwood country, terminating at Eureka 230 miles later. No competition to the UP or the other streamliners parent South Pacific was still running, but a bit of drama not easily found today.